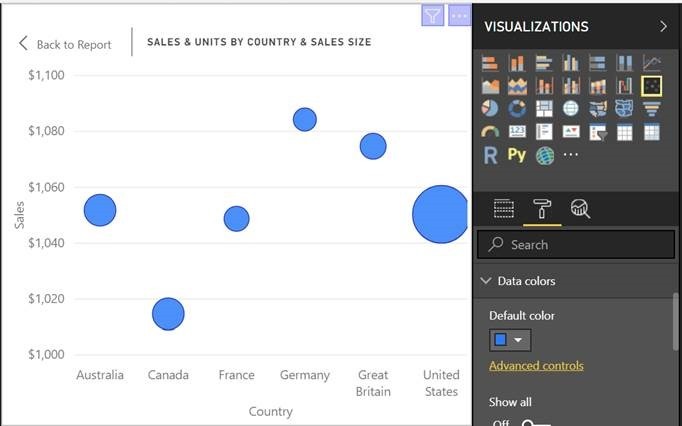 We have a massive Power BI Desktop update this month. Composite models, which allow you to combine direct query and import sources together in one model, is now generally available. Two of the top feature requests on UserVoice, expand/collapse on the matrix and copy and pasting visuals between Desktop files, are also shipping this month. We are previewing a completely revamped filter pane that is highly customizable and have a ton of other product updates as well! We are very excited to announce the release of one of the most requested visual features, the ability to expand and collapse individual row headers. The expansion state of the matrix will save with your report. It can be pinned to dashboards as well, but consumers will need to open up the report to change the state. Conditional formatting will only apply to the inner most visible level of the hierarchy. Note that this expand/collapse experience is not currently supported when connecting to AS servers older than 2016 or MD servers. Another frequent request we are delivering this month is the ability to copy visuals between .pbix files. 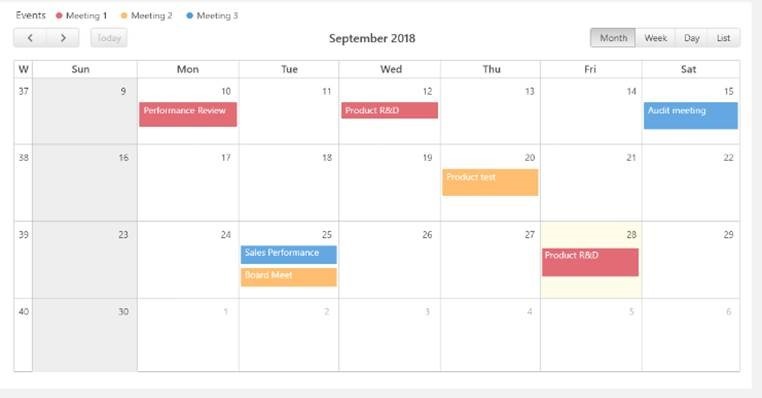 With this month’s release, you can now copy a visual either through the visual’s context menu or through the standard Ctrl+C keyboard shortcut and paste it into another report through Ctrl+V. This is very useful for anyone who builds and updates multiple reports frequently. When copying between files, formatting that has been explicitly set in the formatting pane will carry forward, and anything that is relying on a theme or the default settings will update to match the theme of the destination report. If the fields in your model are different, you’ll see an error on the visual and a warning on the fields that don’t exist, similar to the experience you see if you delete a field in the model a visual is using. All you’ll need to do is replace the broken fields with the ones you want to use from the new model. If you are using a custom visual, you’ll also need to import it to the destination file as well. Our filter pane is a very important part of any report, and we’ve been listening to all the feedback we get from the community to learn what would be the most impactful updates we could make. We’d hear that consumers won’t understand what filters are affecting a visual. 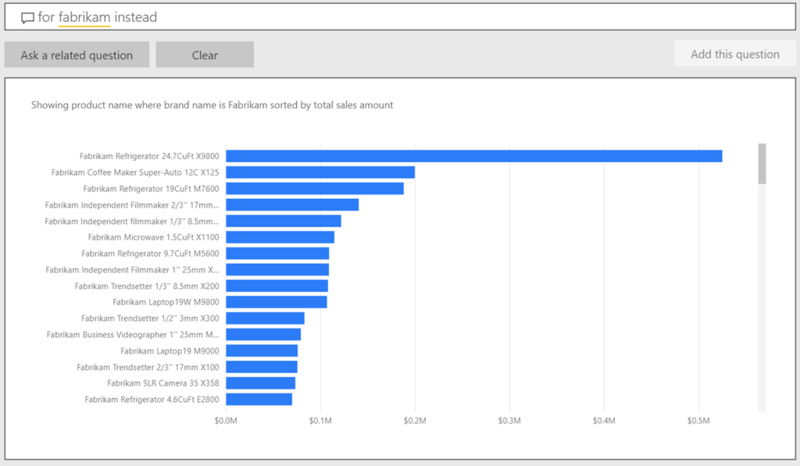 Not only does the filter pane showing up as collapsed at the corner of the report making it difficult to notice, it also didn’t have enough configuration and customization options to meet all your needs when building reports. Based on all this feedback, we have a preview of a fully revamped filtering experience. 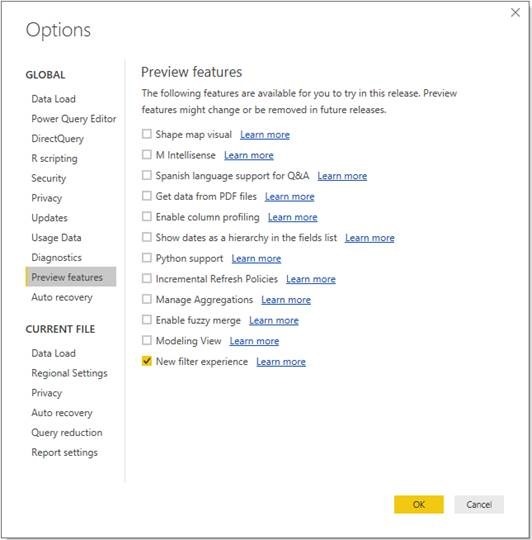 To start using this new filter pane, you will first need to enable it through the Preview features section of the Options dialog. After this, it will be enabled for all new reports. For existing reports, you’ll additionally need to check the option under Report settings in the Options dialog. Once the new filter pane is enabled, you’ll see it attached to the report page. It will be formatted by default based on your current report settings. This new filter pane is what your report consumers will see when you publish your report, and the older filter pane now acts as a filter editing pane. 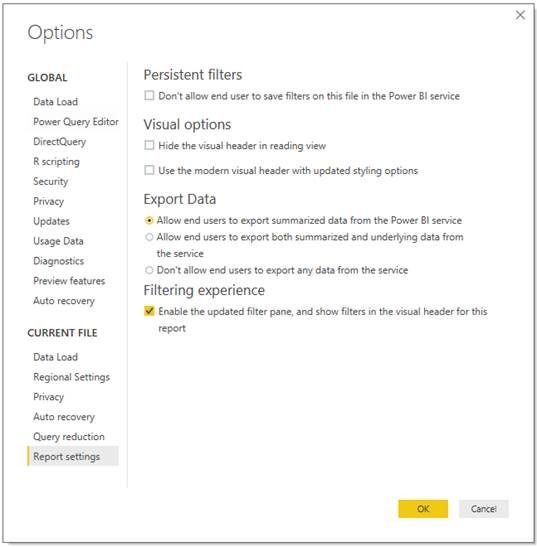 This means you can update existing filters through the new pane, but you’ll use the older filter pane to configure which filters to include. Note: Wondering why we have two filter panes? 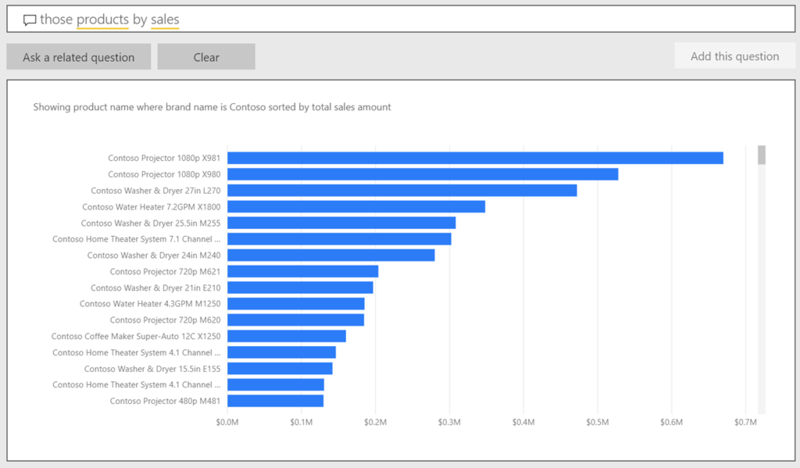 The new filter pane gives you a taste of what your report consumers will see without publishing the report (same as any other visual in your report). In a few months, we will remove the old filter pane and the new pane will be used to add new filters as well. 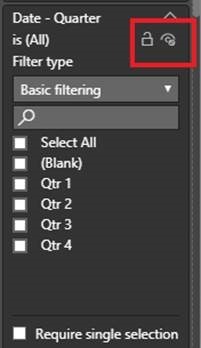 To show and hide the new filter pane, you can use the eye icon next to FILTERS title of the filter editing pane. This saves with the report, so you’ll be able to completely hide the filter pane from your report consumers if you want. You can also use the filter editing pane to lock or hide individual filter cards. As you toggle these settings in the editor, you’ll see the changes reflected in the new filter pane. Through the formatting pane you can format both the new filter pane, and the individual filter cards. 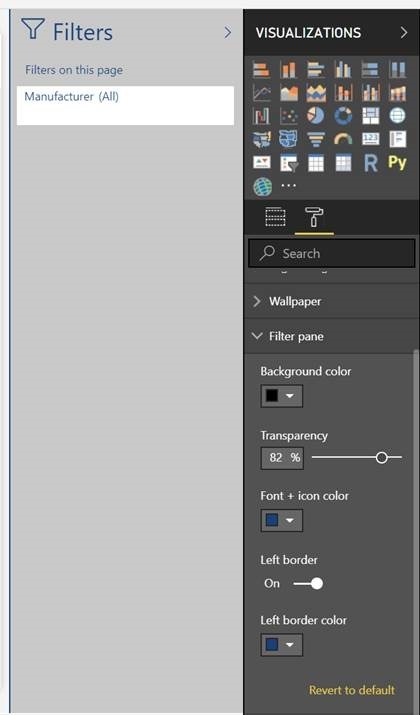 For the filter pane, you can format the background color and transparency, the font and icon colors, and the color and visibility of the left border of the pane. You can format the filter card’s background color and transparency and border color and visibility. You’re able to format these properties for both the state when the filter is cleared (Available) and the state when the filter is set to something (Applied). Another benefit of this new experience is that you can now see a read only view of filters that are affecting each visual. You can hover over a filter icon in the visual’s header to see filters, slicers, and cross-highlighting state that is affecting what data is showing in the visual. This new icon is on by default (provided your preview switch is checked as called out above), but of course you can turn it off for your report consumers through the visual header card in the formatting pane. We have lots of accessibility improvements this month in the reporting space. Press tab to exit the activated list and return to the top of the pane. 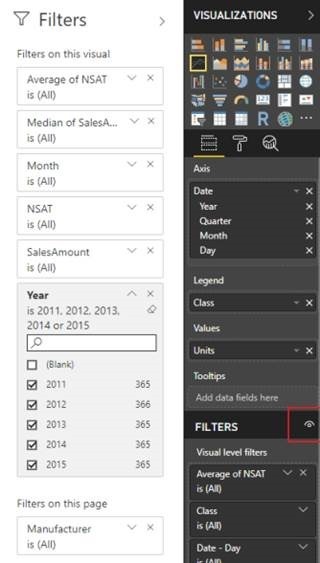 Lastly, we are enabling you to more quickly navigate to different areas of Power BI Desktop through ctrl+F6. Instead of just jumping between visuals on a page and the page tab switcher, you can also quickly jump to whatever panes are currently visible, the view switcher on the left and the account options on the top right. You can still reach the ribbon through pressing Alt. For quite a while now, we’ve had two different ways to dynamically color a visual’s data points depending on the visual type. Our charts had a color saturation option in the field well that gave you basic controls, and the table and matrix visuals had conditional formatting. We’ve added a ton of functionality to the conditional formatting experience for table and matrix over the last year, but the color saturation feature for cartesian charts hasn’t received much love. With this upgrade, you’ll notice the color saturation bucket is no longer in the field well. 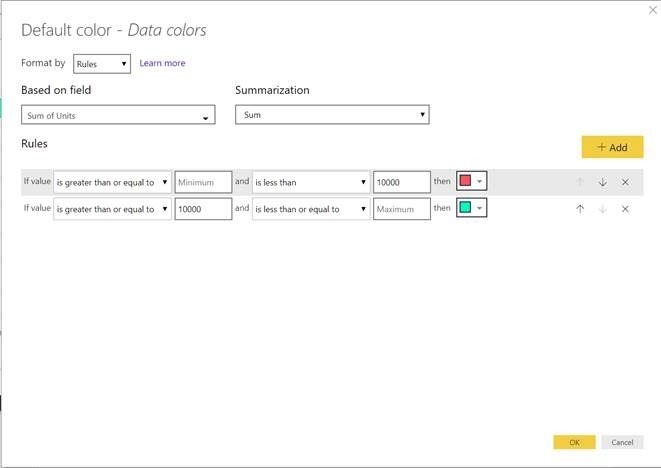 Instead to format, you’ll go to the Data colors card in the formatting pane. Here you can format with the color pickers as normal or select the Advanced controls option to launch the conditional formatting dialog. Once there, you can use any of the three conditional formatting options and select OK to apply the formatting. And that’s it! The conditional formatting colors will apply on top of whatever formatting you already have through theming and manually picking through the color pickers. You can now ask related questions in the Q&A explorer dialog, which means that the answers to your questions can take into account the previous question’s context. For example, you can start by asking for the products sold by Contoso. Then you can click the Ask a related question button and ask the related question for the sales for each of those products. You can continue to ask follow-up questions and can even change filter context, like by asking to show Fabrikam products instead. Once you turn on the preview in the Options dialog, you’ll see two relationships views. You’ll be able to recognize the new preview one through a little star on the bottom right corner of the icon. Our new composite models feature is now generally available. Thank you for all the great feedback during the preview period. It has really shaped the feature. In fact, in addition to GA-ing the feature this month, we also have an update that’s based on your feedback. We now allow relationships that are between different sources to have a cardinality of Many to 1 to reflect the actual cardinality of the data. While the relationships still have the same “weak” behavior as relationships that have a cardinality of Many-to-Many, allowing the true cardinality to be defined permits additional optimizations and clearer models. We have three DAX updates this month. In support of our new expand/collapse feature for the matrix visual, there’s now an additional optional DrilldownFilter argument for the RollupAddIsSubtotal function and a new NonVisual function. Additionally, we’ve added the IsInScope function, which is a better way to detect hierarchy level in a measure expression. Some popular tasks you might need this for include (1) calculating child percentage of parent subtotal and (2) calculating ranks of children under different parents. You can find more information on these formulas here: ISINSCOPE, NONVISUAL, New argument for ROLLUPADDISSUBTOTAL. You can download this visual on AppSource. 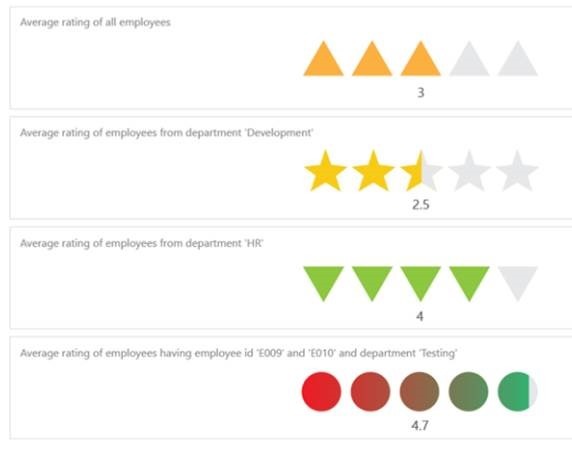 The Ratings by MAQ Software custom visual lets you add ratings or scores to your reports. You can show either the average ratings or break it down over a specific category. You’re able to choose between four different shapes and between a solid and gradient fill. Check out this visual on AppSource. 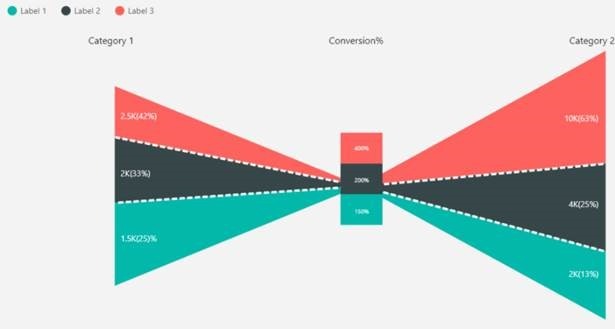 The Hourglass Chart by MAQ Software custom visual lets you compare category values between two scenarios, which is very useful when showing conversion rates. You can find this custom visual on AppSource. 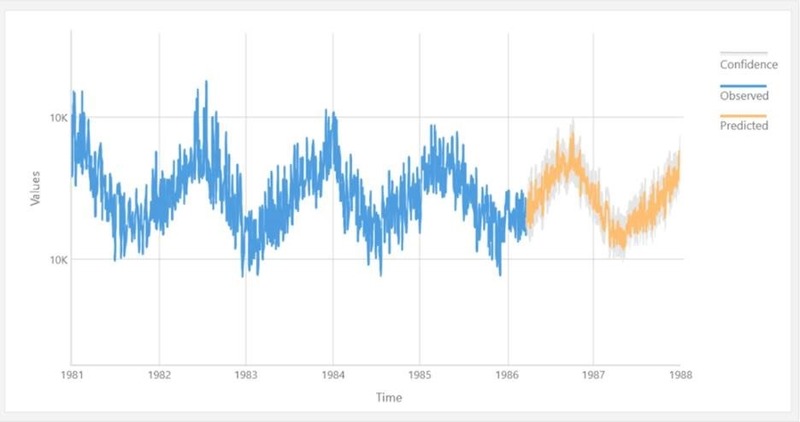 The Forecast Using Multiple Models by MAQ Software R custom visual allows you to forecast future values based on historical data using four different forecasting models. The models include Linear Regression, ARIMA, Exponential Smoothing, and Neural Network. You can manually adjust the parameters of the learning model, show the confidence intervals, and decide on the split point. 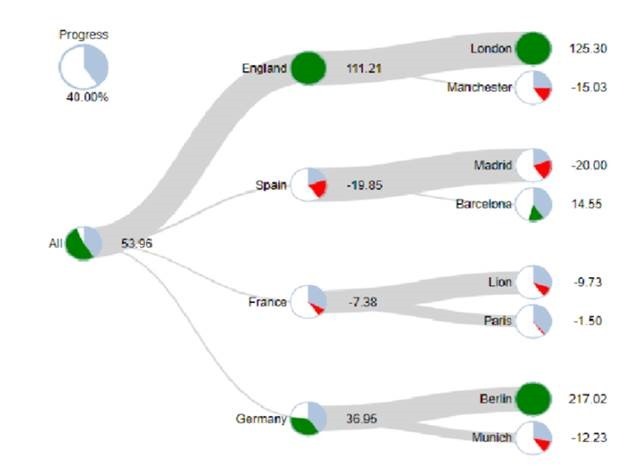 The Pie Charts Tree custom visual by Aritz Fancoy lets you display a tree visual with pie charts as the nodes. To create a plain tree structure all you need to do is add multiple fields to the Categories bucket in the fields list. From there you can add data labels with the Values bucket, percent of target pie charts with the Target bucket, and progress percentage with the Progress field. This month we’re excited to release a new connector for Azure DevOps Server, allowing you to import and transform data from Azure DevOps Server in order to build Power BI reports. 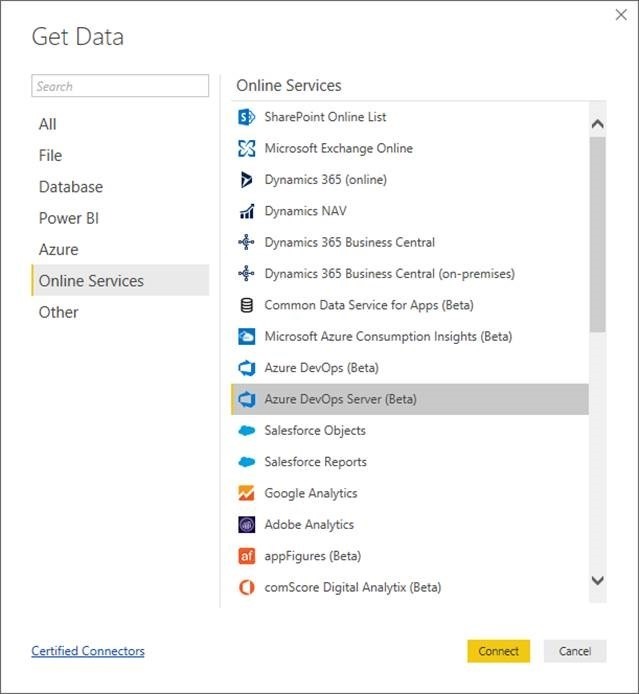 The new Azure DevOps Server Connector can be found under the Online Services category within the Get Data dialog. The PDF Files connector has been enhanced in this release to allow you to specify Start Page and End Page optional parameters, which restricts Power Query to only explore a given range of pages for discovering tables. 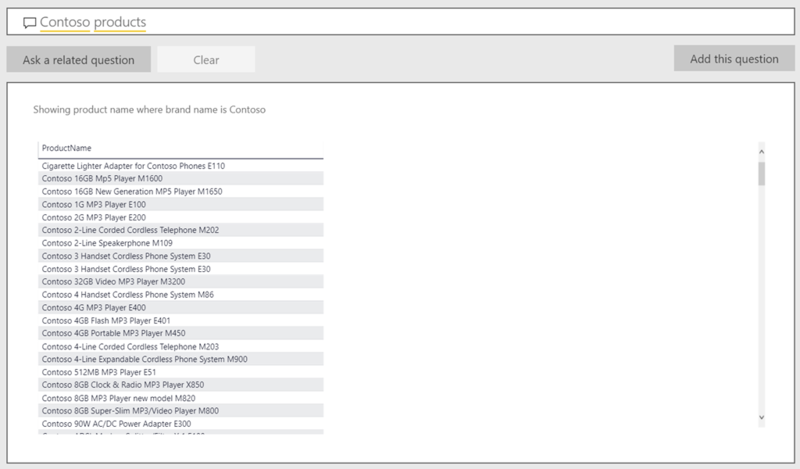 This month we’ve enhanced the Azure Consumption Insights connector to add Budget and Reserved Instances data. That’s all for this month! We hope that you enjoy these updates and continue sending us your feedback. 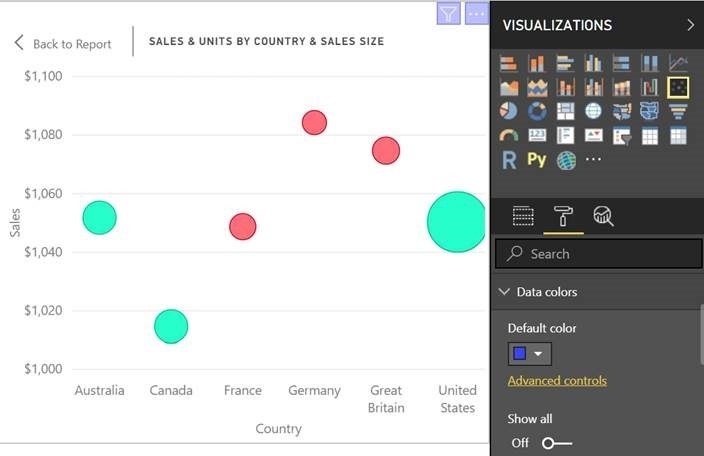 Please don’t forget to vote for other features that you’d like to see in the Power BI Desktop. For any preview features, you can always give us your feedback in our active community. 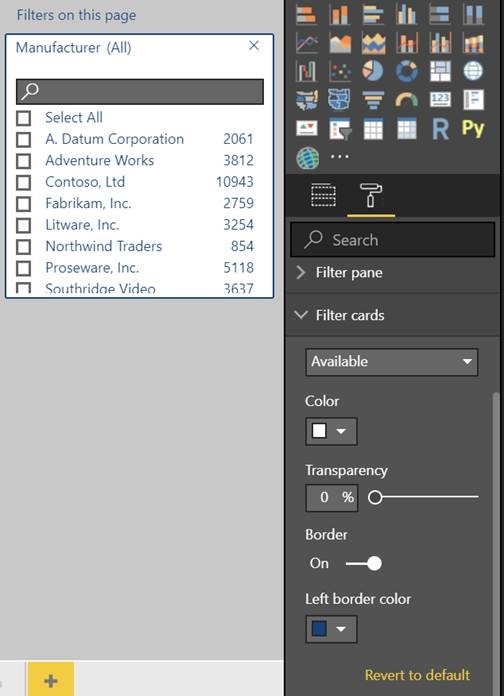 You can also download the .pbix file I used, and if you’re looking for a similar design for your reports, I was using the Microsoft layout from PowerBI.Tips.